In this theme we’ve added a new template page – Frontpage, which can be used to create a frontpage based on posts. (previously the only way to create a frontpage was to configure widgets in specific widget areas). This feature will be very useful for users who can’t or don’t want to use the quickstart package and thus have to set widgets on the homepage manually. Posts used for the frontpage are in the Frontpage category, and they have specific tags that should be used to set their position. For example, the first post with the header has the “header-1” tag, whereas the other posts after the header has the “after” tag. …that allows you to change your tags, edit posts, add your own posts to the Frontpage category etc… If you want to change the order of the after posts you would need to change the date that the post was published, as new posts are displayed at the bottom. 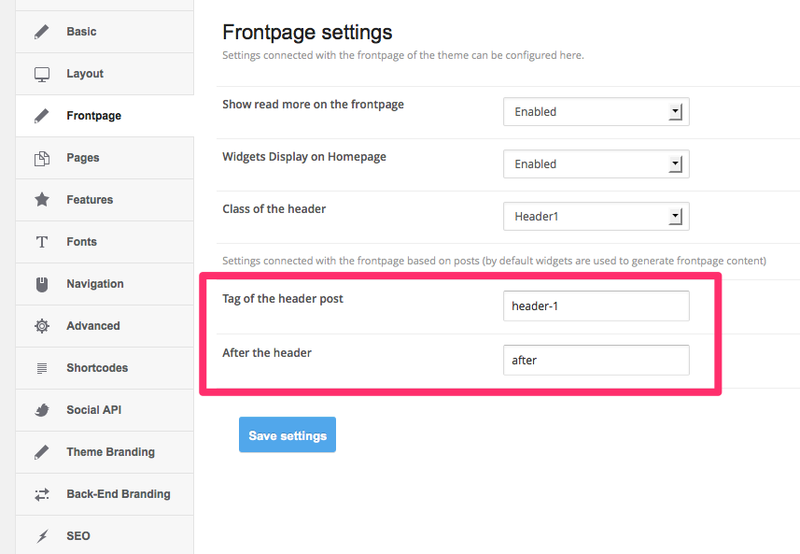 You can alos change “tag of the header post” option to set another available header (header-1, header-2, header3).